Last night my dad and I celebrated Cinco de Mayo by seeing a movie about the Civil War. I made a quesadilla and ate it on the way to the movie and then snuck my nightly container of melon into the theatre. 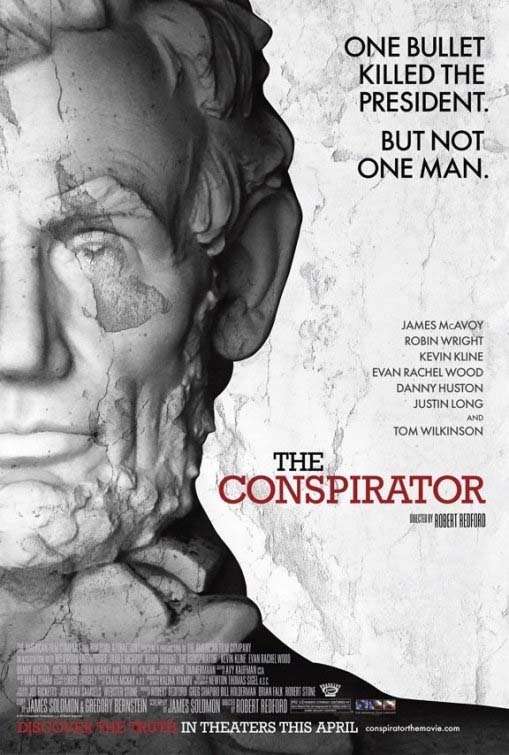 The Conspirator is a movie that tells the story of the trial of Mary Surratt, the only woman charged as a co-conspirator in the killing of Abraham Lincoln. It was a story I’d never heard before and the history nerd in me loved it. I was excited to see some familiar faces like James McAvoy, Alexis Bledel, and Justin Long in the cast as well. The story doesn’t shed a very kind light on our government at the time, but it was so interesting to see how things really worked back then. I definitely felt drawn into the plot and emotionally involved with the characters. My dad and I also think we discovered an important argument in the case that was left out of the trial…we totally should have been the lawyers. Go see this movie! It’s great! Remember how on Wednesday I said that Bikram was pretty easy for me now that I’ve been doing it for a while? Well that came back to bite me because today’s class was hard! The feel of each class varies so much depending on how YOU feel, how much sleep you’ve gotten, how hot the room is, the pace of the class, etc. Today’s was a little tough, but those are the classes I feel best after. I love knowing I worked hard! Overnight Oats in a Jar…except the Jar was just an empty one that I saved and didn’t actually have any almond butter left in it. 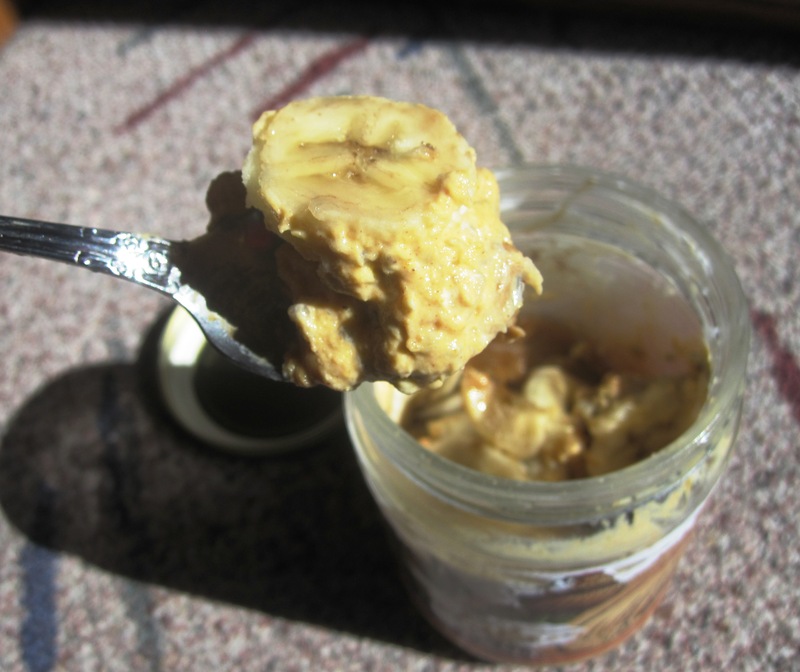 On top went 1/2 banana and a dollop of almond butter from a different jar. 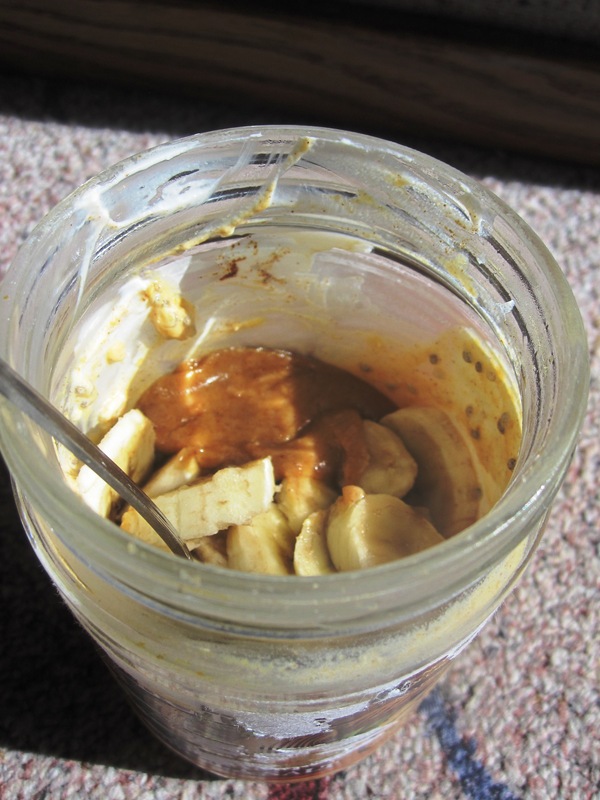 I mixed it all up and the almond butter ended up getting lost… I didn’t even get to taste it! Major bummer. Still a delicious breakfast. Off to get some work done! Keep entering my Love Grown Granola giveaway!! You have until Sunday. What movie have you seen recently or what movie are you excited to see soon? I can’t wait to see Something Borrowed!! I’m going to see Rio tonight and I can’t wait haha. I’m also excited to see Water for Elephants and Something borrowed; I hope both are as good as the book. I saw The Conspirator too, and I felt the same way about our government when I left the theater. Do you think that Mary Surratt was actually guilty? I don’t even know what movies are out…I’m so out of touch with new movies these days! I know I want to see some older ones– The King’s Speech, and Black Swan! But I don’t even think those are in theaters anymore! Ooooh I’m super excited to see it too! My b-day is tomorrow and my bf is sucking up his man pride and taking me to it ( even tho I’m pretty sure he wants to see it too lol) I read the book and couldn’t put it down. I just finished something blue and didn’t like it as much but oh well 🙂 hope u like it! Ps I looove “upscale” sweats! I hate that y’all are wearing sweatshirts – here it’s almost even too hot for shorts! I do like the warmth, though, so no huuuge complaints. I dont know when its coming out, but I cant wait to see the new Pirates of the Carribbean! Jealous that you still have pumpkin! I clearly did not stock up enough!! that movie sounds really good i need to see it along with water for elephants!! that is tragic about the lost almond butter. I hate when that happens! and good work on the movie snacks! glad you liked the movie, I have been looking forward to seeing it! Movie sounds awesome! I grew up mostly in IL, and Lincoln was truly an amazing person/president. Way to get your history on’ girl! Hope work is going well, hopefully we’ll be in touch soon! Bridesmaids for sure. I asked my bf if he would go see it with me and he said only if he had a couple of drinks before haha. oh well. will have to have a girls movie date w/friends! also i love your love for JCrew. I have an addiction! Just wished I lived near an outlet! I’m dying to see Something Borrowed! I absolutely adore Ginnifer Goodwin. I think she’s adorable. That movie sounds good– i want to see it!